Ensuring the quality of our products is one of the fundamental aims of the TANAKI company. Total quality management, in line with up-to-date standards, guarantees the highest quality of product. The products and production processes are audited on a regular basis to ensure efficiency and safety. 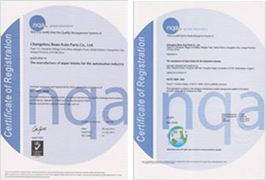 Our manufacturing facilities are certified according to ISO 9001/TS 16949. Production processes involve initial screening of samples, quality control, sample approval, in-process audits and quality control of the finished products.